Free air delivery increased through high efficiency. In addition to a configurational change of the suction and discharge ports, the design of the valve has been modified from U to I shape so as to employ a flapper valve which minimizes leakage of compressed air. Provided for minimizing generation of heat during suction is a high-cooling head. All of these have further increased air delivery. 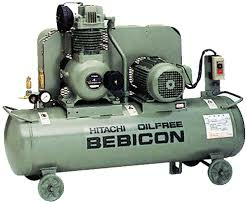 Temperature lowered with aluminum cylinder head and HITACHI's cooling fan. High efficiency flapper valves employed for ling life of 10,000 hrs. The main body has adopted a special light alloy having a long life. It is lighter and provides a higher efficiency than castings. In addition, temperature is kept low owing to use of the high-cooling head. In consequence, the lifetime of the air valve has been extended. Mounting area and weight reduced by aluminum cylinder head. Each compressor has been designed so as to ensure a logical arrangement of the motor and control device, and to locate the gravity center as low as possible for the purpose of stabilization. Thus, installation is possible with minimal space. Both handling and transport have been made easier. Pressure gauge, pressure control devices and stop valves equipped in one manifold.